Senior Audrey Jewett has taken her love of the outdoors to a new level by dedicating her time to aiding the Save the Boundary Waters campaign. The birds sing. The sound of pristine water rushing over rocks is mixed with the scurry of squirrels hurrying up and down trees looking for food. The Boundary Waters Canoe Area Wilderness (BWCA) contains the natural beauty Minnesota prides itself on. Unfortunately, the ecosystem hangs in the balance between people visiting and enjoying the beauty, and destroying it; senior Audrey Jewett captures the elegance of the land through photography while fighting to protect the area she loves from pollution and destruction. It makes sense that Audrey’s family and countless others are drawn back year after year. “My cousins and I, when we got older, we could have let the tradition die out and done our own things. But, we made sure with our work schedules and everything that we made it up every summer and kept the tradition going, and the family going,” Jewett said. Jewett knew she had to do something to prevent the pollution before it was too late. “My aunt and uncle live just outside the boundary waters and it affects their lives if this mining goes through. I could see the cause and effect and what it could do,” Jewett said. Jewett seized the opportunity to help save the BWCA from dangerous mining. She volunteered to work with Amy and Dave Freeman, a couple from Minnesota who planned to paddle over 2,000 miles to the nation’s capital in order to present a petition to stop the mining as well as their Save the Boundary Waters campaign. Her passion and dedication earned her the position as the Hennepin County Student Representative for the campaign. “They now ask me to do anything presentation wise. If they need a volunteer, since I’m well versed of the issue now. I’m asked to can go to events where Dave and Amy are being represented. Any place where paddle to DC has a booth I’m invited to come,” Jewett said. Jewett also understands that the more people knew about the issue, the more people would sign the petition, and the closer they could be to saving the ecosystem. “I just went and approached the theology department and said this is happening, and I want to do something about it. They totally took it on, and encouraged me every step of the way,” Jewett said. Taking pictures gives Jewett a way to capture the sheer awesomeness of nature while expressing her creativity. “Photography is sort of a release. A bunch of my friends can paint. I watch my friends create these paintings, and I’m like ‘well I can take pictures,” Jewett said. Being able to express to people why she loves what she loves, and materialize those feelings through her photos is a talent that help raise awareness for the campaign. She plans to continue the skill and develop it. 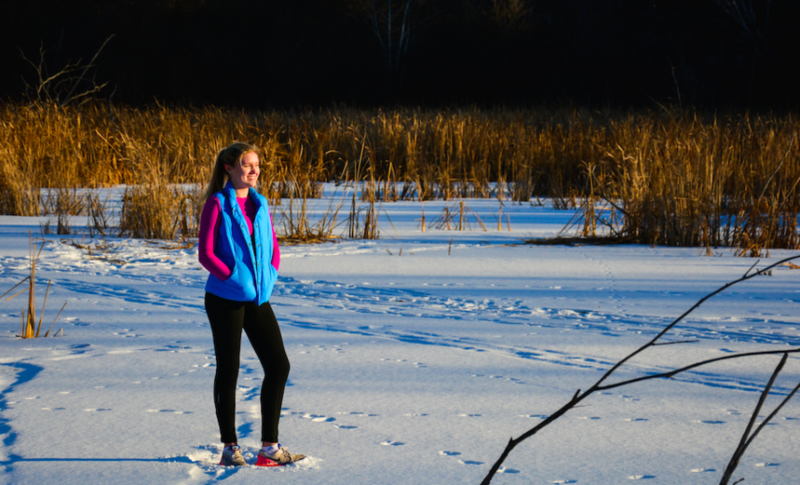 “I’m always going to be taking pictures; I can’t imagine my life without it,” Jewett said. As Jewett continues to work for the Save the Boundary Waters campaign, she is also outlining a plan to continue fighting for her beliefs. “I’m hopefully going to minor in social justice. I’m not going to be able to always keep up this specific topic, but I always will be willing to advocate for the boundary waters whenever necessary. I want to keep advocating for things I care about, and possibly make a career out of it,” Jewett said. The campaign reached an important milestone on December 3rd: Dave and Amy Freeman arrived in Washington D.C. to present the petition to save the BWCA and hold a youth outdoor engagement fair coordinated by Wilderness Inquiry to raise awareness for water quality and wilderness issues. Due to Jewett’s introduction to the issue, BSM has added over 300 signatures to the petition, and raised even more questions about how humans interact with the natural world. Save and preserve the boundary waters!!!! Natural beauty like this must be saved!! !